The lumbar region is crucial for the rest of the body to work efficiently. At such a compromised spot, the area is prone to injury, whether it is from overexertion, obesity, age, occupational hazards, sports, which makes understanding this region a priority. Lumbar Injury Biomechanics will be highly applicable to a broad range of audiences, including those who are studying biomechanics, accident reconstruction, medical and rehabilitation, insurance, legal law enforcement. The lumbar region is crucial for the rest of the body to work efficiently. At such a compromised spot, the area is prone to injury, whether it is from overexertion, obesity, age, occupational hazards, sports, which makes understanding this region a priority. Jeffrey A. Pike, President of Biomechanics Consulting, Inc. has authored Lumbar Injury Biomechanics, the third in a series of biomechanics compendia. The book is compiled of 15 of the best papers in the industry, from libraries of SAE International, IRCOBI, Stapp, NHTSA, ESV, and the Association for the Advancement of Automotive Medicine, which makes it a valuable, comprehensive tool. The book, updated from a popular earlier volume, focuses on dynamic papers from 1994 to the present day. It also includes an introductory new chapter titled, “Blunt Lumbar Trauma,” which will provide an overview of the anatomy of the lumbar region, injuries and their mechanisms, as well as an update in the industry’s literature. Pike is president of Biomechanics Consulting, Inc., which provides research, educational, and forensic biomechanics consulting services. His previous experience includes senior technical specialist for the Ford Motor Company, and adjunct professor at Wayne State University, Biomedical Engineering Department. He has been a consultant to the Centers for Disease Control (CDC), National Academy of Sciences, National Highway Traffic Safety Administration, Department of Justice, and state and local governments. His current projects include consulting on a CDC/National Institute for Occupational Safety and Health contract to develop restraint systems for providers of in-ambulance care. 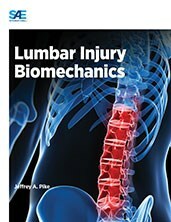 Jeffrey A. Pike’s book Lumbar Injury Biomechanics is now available in the SAE International Bookstore under product code PT-153. If you would like to order this book, please visit http://books.sae.org/book-pt-153/ or contact SAE International’s Customer Service at 1-877-606-7323 or 1-724-776-4970 (Outside the U.S. and Canada) or via email at customerservice(at)sae(dot)org. SAE International is a global association committed to being the ultimate knowledge source for the engineering profession. By uniting over 138,000 engineers and technical experts, we drive knowledge and expertise across a broad spectrum of industries. We act on two priorities: encouraging a lifetime of learning for mobility engineering professionals and setting the standards for industry engineering. We strive for a better world through the work of our philanthropic SAE Foundation, including programs like A World in Motion® and the Collegiate Design Series™.